Finally, after two weeks of slogging through mud, wind and rain along the best bike trail I know, I could see it. This was no mirage. All the anguish vanished from my mind and body as my own personal Shangri-La came into view. 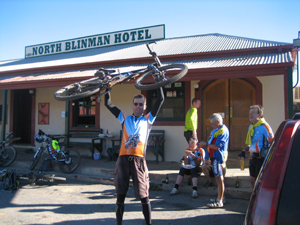 The North Blinman Hotel. Made it. I was a long, long way from being anything like fit and ready for the 2013 Bicycle SA Outback Odyssey. Interstate and overseas travel, the associated jet lag, a lingering head cold and a cracked right rib conspired to put paid to any plans I had about getting properly fit. I’m generally pretty underdone when it comes to tour preparation, but this year took the biscuit. Had I made the right decision to embrace another 900+ kilometres of off-road riding? Would experience and muscle memory be enough? Only time would tell. The threat of bushfires prevented us from ascending via Stone Hut Road from Castambul on Day One. Given the weather that accompanied the Odyssey for the majority of the fortnight, the notion of bushfires seems almost incomprehensible now. Because of my lack of fitness, I was quietly relieved that we were going to be sticking to the road. It’s a nice walk up through the hills of Castambul, and the views are brilliant, but my bike and I have done it quite a few times already. The climb up through Kangaroo Creek Dam along Gorge Road was challenge enough for me, in any event, but I managed to keep on pedalling. 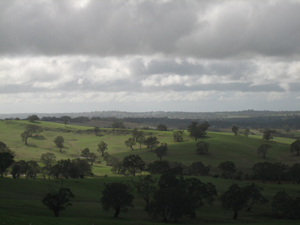 The toughest climb, though, was the last push of the day, just before we dropped into Lobethal. I was glad to have saved some energy due to the detour, but it was a good workout nonetheless. I’d need everything I had in reserve to get me through the next few days while I regained some bike fitness. After a couple of damp, challenging but reasonably uneventful days, we left Riverton on a cloudy, drizzly and cool Tuesday morning. 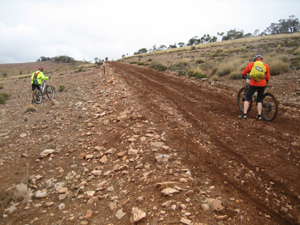 The recent rains had rendered sections of the Mawson Trail all-but impassable, due to deep, deep mud. This deprived most people of the pleasure of riding the trail all the way from Clare to Burra, as Mawsoneers were diverted after traversing the first few kilometres of Angus Court Road. This was a shame because the trip up and over the Camel’s Hump and on into Burra along the glorious red dirt is one of the early treats of the Odyssey. A couple of intrepid adventurers ignored the detour and rode the full Mawson and, while I was happy for them, I wasn’t envious. Especially when I saw their photos. The weather was certainly better behaved for the middle section of the Odyssey. It was still fresh, and I was wearing quite a few layers on Thursday, but the skies were significantly brighter. The day started with a detour along the bitumen, followed by a muddy climb to morning tea, but improved after that. The ride through to White Hill and then along Dust Hole Creek Road to Dare’s Hill is both challenging and exhilarating, and 2013 was no exception. Tooralie is no longer available for camping, so it was on to Hallett for our evening’s revelry. This stretched the day out to a distance of 89 kilometres, and the last windy and undulating hour of the day’s journey certainly made the extra distance memorable. The pre-dinner recovery session in the recently re-opened Wildongoleechie Hotel was well-deserved. The rides to the pleasant towns of Spalding, Laura and then Melrose were completed in good conditions and, although some sections of the track were still wet, slippery and muddy, the blue-ish skies brightened things up. Highlights included the big climb through the wind turbines on the way to Spalding, riding the Bundaleer Channels, the lung-busting traverse up and over the Never Never Range, and the fast and bumpy Sunday morning stretch along Lynches Road. 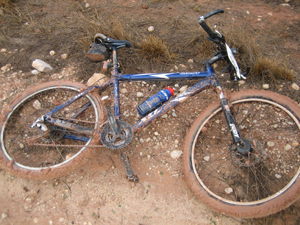 After lunch on Tuesday, the day of the Melrose to Quorn leg, the mud was almost impossible to negotiate – even on foot. Many, perhaps most, turned back and sought the solace of the blacktop. A few of us pressed on. We rode when we could and pushed when we had to, often stopping to poke out the red, sticky clay from wheels, frames, cranks and chains. It crossed my mind that we might have been mad. Despite spending more time on foot than on the pedals as we crossed Richman Gap, we were truly grateful that we’d done so when we reached the summit. Under grey skies the vista was breathtaking, if not quite as spectacular as usual, and the scrabbly downhill was dry enough to enjoy some full-tilt descending. We’d certainly earned it. Things got off to a bad start the morning we left Quorn. I was waiting to depart, perched upon my bike, leaning on a fence post in the dark, drizzly gloom. As I pushed off to leave, my wheels refused to move. They’d sunk and gotten stuck in the mud while I’d been sitting on the bike. I fell to the left, couldn’t get my shoe out, and hit the ground pretty hard. It hurt a bit, but no one saw – that’s the important thing. There was more mud to come, not long into the day. It was pretty solid stuff too, but we were getting used to it. The post-lunch ride to the Cradock Pub, now officially part of the Mawson Trail, was pretty tough. The mud was wheel-stopping in parts but at least the sun was shining. I kept my swearing to a minimum. After cleaning the crud of my bike I noticed that I’d broken a(nother) spoke. My wheel would just have to cope for the last couple of days. The muddy campsite at Hawker added a final emphasis to what had been a hard day. Everything I had with me was now officially brown. By some miracle, the skies brightened for the last couple of the days of the Odyssey. We still endured detours, and it was quite cool and windy, but it was dry and not too muddy along the revised routes on Thursday. It was an easy ride until we arrived at the Moralana Scenic Drive, where we turned into the wind and enjoyed the next 30 unforgiving, bumpy, undulating kilometres. At least the surface was hard. Friday was almost perfect. Clear blue skies and dry ground. No need for detours. The bouncy thrills around Rawnsley Bluff in the shimmering, ice-cold dawn sunlight were brilliant, and the rest of the day lived up to all expectations. The single-track out of Wilpena is still close to being the best stretch of the Mawson, the views from the top at Razorback were unsurpassed, and the afternoon grind was a terrific workout. It’s a pretty tough course, and has every sort of riding imaginable, but it’s hard to beat. And, of course, there’s the ultimate pay-off. Blinman. Given the myriad diversions and poor weather, I suspect that first-timers might have wondered what all the hype is about. My advice is to come again and hope for sunshine and a bit of warmth. There’s no doubt, however, that this year’s trip was an adventure. I didn’t mind most of the detours as I think that I have probably traveled every inch of the Mawson in previous years. And it’s not just riders who were affected by the conditions. The organisers, marshals, volunteers – everyone involved in putting on the tour – had to do a lot of fast thinking and quick planning to make the journey a success for all. Even though the two weeks was challenging in many ways, the spirits of all involved, whether on a bike or not, remained commendably high. The 2013 Odyssey was something different, something I will always remember. I was still quite sore on my left hand side when I returned home. The doctor confirmed my suspicions – I’d cracked two ribs when I fell as I was leaving Quorn. He mentioned something about “men of my age” and “knowing better” but I wasn’t paying attention. I was dreaming of the Mawson Trail.